This summer, five WCWC teammates embarked on a 303-mile bikepacking trek from the southern terminus of the Oregon Timber Trail to Oakridge, covering the Fremont (Section 1) and half of the Willamette (Section 2). This weekend they’ll share their stories about riding on this newly-created trans-state trail. 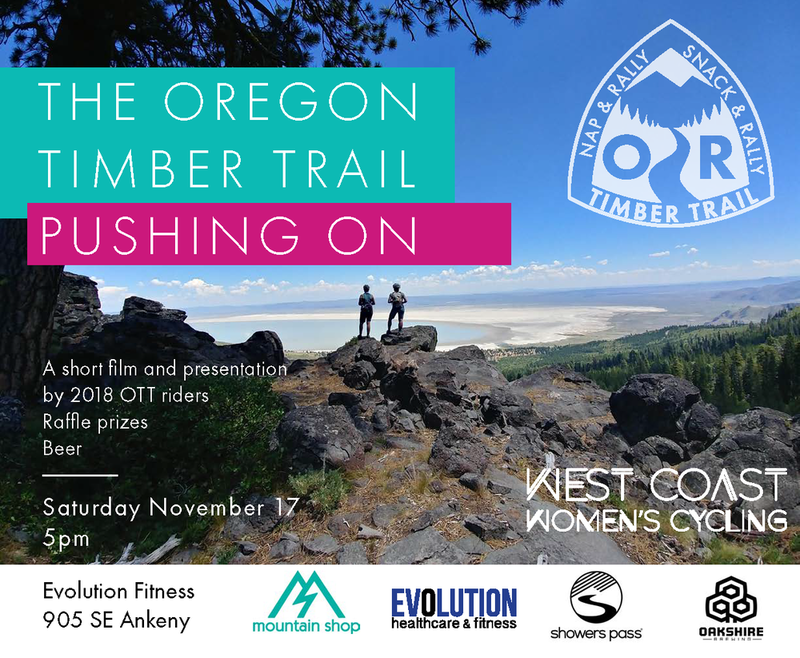 The Oregon Timber Trail: Pushing On will feature a short movie they made from the trail and a chance to check out their rigs, gear and set-ups as well as beer sales and a benefit raffle to support the Oregon Timber Trail Alliance - the badass trail stewards who put in the hard work to make this incredible opportunity possible for everyone. Raffle prizes have been generously donated by Showers Pass and beers are provided by Oakshire Brewing. Thanks to both of our sponsors for helping to support this event! Teammate Kristi Cushman crushed it at the XC races this weekend with two podium finishes! She came in 1st place in Saturday’s Corn Cross 2 (11/10) out in Boring, OR and then followed it up with a 2nd-place finish in the River City Cross Crusades race at Rainier High School on Sunday. Congrats on the back-to-back win - you do us proud, Kristi! 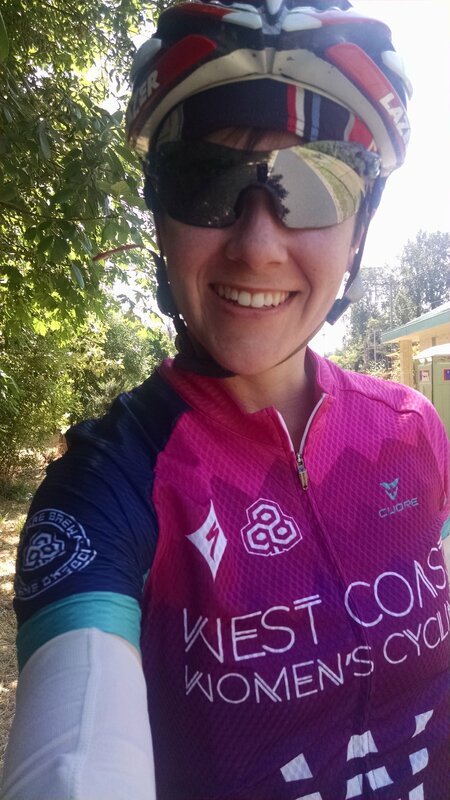 The West Coast women are excited to add Heather Van Valkenburg to the roster! Heather lives in the Vancouver/Portland area but can be found shredding all across the Pacific Northwest. She's and experienced racer and has been making cameos in WCWC's mountain biking photos over the years, as she's been a go-to partner in crime for many of our fat tire-inclined teammates when they hit the trails. Heather says: "Although I've raced almost every cycling discipline (no BMX... yet), my heart currently lies on my mountain bike. I plan to do a few enduro races this year, but really want to adventure, camp, and just continue to be outside. I love hiking, camping, and backpacking too." Have you ever heard of Mountain Bike Orienteering? Neither had we, until we met first-year team members Sue and Abra. They’ve introduced us to a whole world (literally) of this niche sport that combines riding on trails, racing, and backcountry navigation and map-reading skills. Competitors are handed a map shortly before the race start with checkpoints (called controls) that they must reach in a certain order, but how they get there is up to them. That’s where the navigation skills come in - choosing the most efficient route (smoothest trails, least hills, etc) is key to speed. Whoever makes it to all the controls and back to the finish line in the shortest time is the winner. Like anything related to mountain biking, the sport requires a great deal of fitness, and also the ability to improvise when things go wrong (like getting a flat tire), while also forcing athletes to think and plan under pressure. While it’s still a fairly small scene in the US, it turns out that MTBO is huge in Europe, with orienteering festivals including both bike and foot races with upwards of 11,000 participants. So what else would true WCWC ladies do, but spend their entire summers adventure racing in Europe? Sue and Abra have headed overseas for 5 weeks to train, race, and do some sightseeing in between some of the largest MTBO events in the world in Sweden, Lithuania, and France. If you’d like to follow along with their travels and learn a bit more about this emerging discipline, check out their blog right here. Sue and Abra host orienteering events in the Northwest as well, so if you missed the event at Growler’s Gulch this spring, stay tuned for your chance to give it a try! Our new kits could not have come at a better time, when the sun decided to shine in Oregon! And WCWC has taken full advantage of this weather to show off their new gear! Oakridge Weekend Adventure - A true WCWC quote, "The meadow flowers were all out on Alpine. Hardesty was also a sh*t load of fun, once we finished the 3k climb to the top. Lots of hot break rotors on that steep beast." No fake news here. Those shorts are HOT!!! Actually... they are quite cool and super comfortable - thanks Qloom for making rad shorts! It can only mean one thing... Summer Casual Short Track! And Aliza is not afraid to make new friends. Here she is rubbing shoulders with the locals at Sturdy Dirty Tiger Mountain Enduro. Christine found summer a little earlier than the rest of us - here she is down in Phoenix this past winter. The ride was out of Lost Duchman State Park to Tortilla Flat. Here's to finding longer summers! Summer Solstice means you get to ride well into the evening. And we'll wrap this entry up with a win in the books! Deann rocked the podium last week in Eugene racing in the Twilight Crit - congrats Deann! Last week we hosted a panel discussion on one of our favorite subject, bikepacking, over at Oakshire Brewing in Eugene. One question that came up was around what to stuff in your packs, and what is better left behind. Below is a handy-dandy packing list with our suggestions of what to bring with you on an off-road trip. Download the full list here. What better place to put your navigation skills to the test than on the tangled-spaghetti trail network of Growlers Gulch? WCWC team members Sue Grandjean and Abra McNair are hosting Castle Rock, WA's first-ever Mountain Bike Orienteering (MTBO) race this Sunday, June 11th.